It’s fitting that Yoshi’s Crafted World is the product of a developer named ‘Good-Feel’. Whether it’s by coincidence or fate that Nintendo chose to hook up with the Hyogo-based studio to make a series of saccharine-sweet spinoffs of Kirby and Yoshi games, they sure do live up to the name. Since being transformed into the woolly/craft-y versions of themselves, the two franchises have tapped into a very specific well of platforming design that mixes unique, adorable visual design with approachable gameplay and hidden depth that caters to all skill levels. Yoshi’s Crafted World continues this trend without really shaking things up, making for a game that’s solid and full of charm, but ultimately a little too familiar. 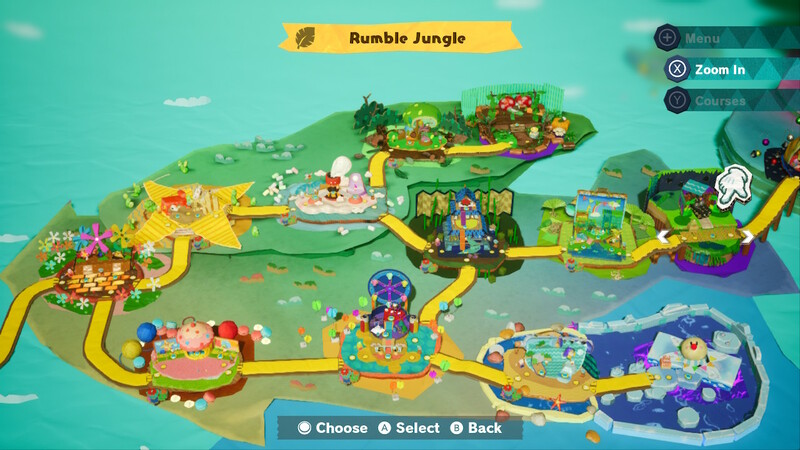 In Crafted World, the Yoshis are living in peace on a remote island where they protect a colourful monolith called the Sundream Stone, which has the power to make dreams a reality. Longtime villains Kamek and Baby Bowser catch wind of the stone’s power and attempt to steal it, the ensuing chaos of which sends the stone’s six precious gems, and the Yoshis, flying across the ocean and into unfamiliar lands. 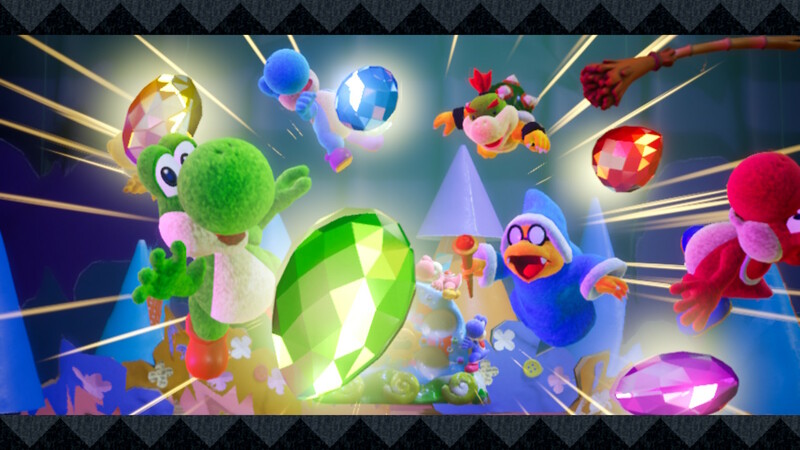 It’s up to the Yoshis then to search for the gems across a multitude of themed levels and recover them before the villainous duo can get to them. Honestly at this point it feels like there’s a machine at Nintendo HQ that randomly generates these game ideas and assigns them to their studios. Not that it’s a deal-breaker or anything. If you’re here for a rich storyline you’re probably in the wrong place, though. What Yoshi’s Crafted World does have going for it though is one hell of a visual style. The title spoils it; everything in the game is designed to look like it’s made out of the kind of arts and crafts materials you’d find in an early primary school classroom. The most impressive thing is just how far that aesthetic extends and how wonderfully realised it all is. This game looks fantastic, blending some of the sharpest and most detailed art in a Nintendo platformer to date with a ton of imaginative flourishes. From simple things like the way paper platforms fold up when you jump from under them, to the way entire levels present like huge cardboard dioramas, I had a huge smile on my face the whole way through. Especially cool are the boss battle intros, where each boss is constructed, piece-by-piece, in a stop motion-style sequence. Where the game’s artistic direction is a shining example of gleeful, Nintendo-esque creativity, the platforming gameplay in Yoshi’s Crafted World comes off as a little more by-the-numbers. That’s not to say it’s bad, there’s an established formula to these games that’s successful for a reason, but it barely deviates from said formula. You’ll still be running and jumping across 2.5D levels, looking for secrets, collecting things and eating enemies to turn them into eggs (science). 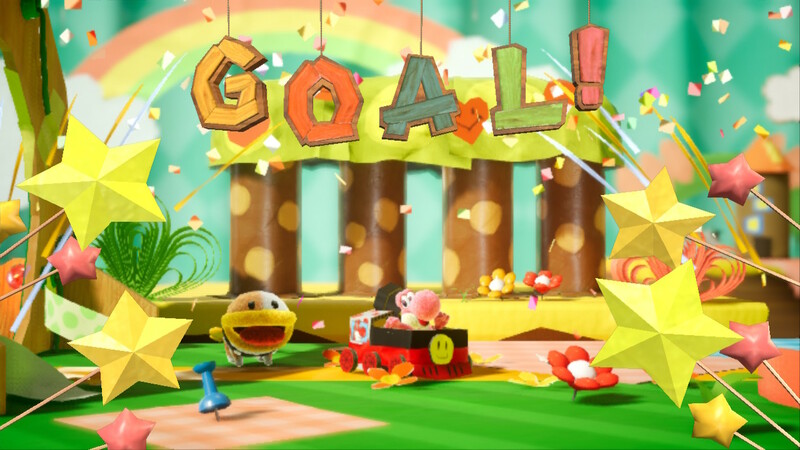 There are a couple of new ideas sprinkled across the game’s forty-odd levels, like being able to throw eggs at things in the fore/background, or a handful of moments where Yoshi needs to collect bits and bobs to rebuild something in order to progress. Overall though, there’s a puzzling lack of craft-related gimmicks. Strip away the aesthetic in favour of something more traditional and 95% of the game would feel exactly the same. What’s there is still a ton of fun of course, but I often found myself wondering if the wonderfully-executed craft theme is wasted on this game. 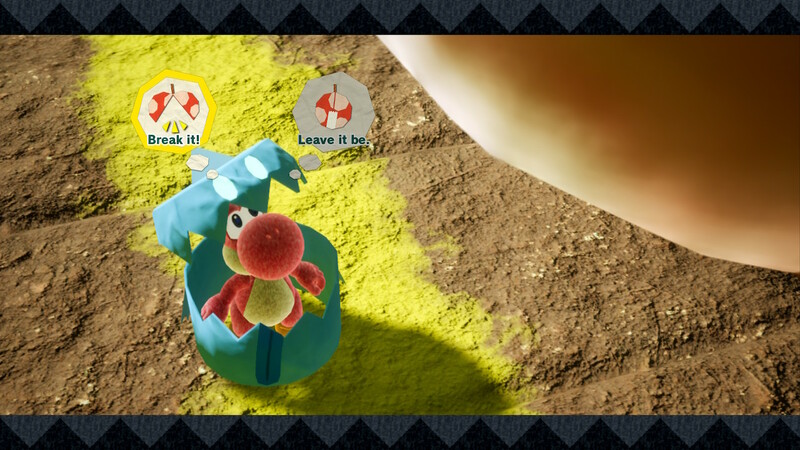 Yoshi’s Crafted World is the latest in a line of recent Nintendo games to put accessibility and approachability at the forefront. Like in Yoshi’s Woolly World for the WiiU, players can opt into the game’s ‘Mellow Mode’ at any point, which mitigates falling deaths by giving Yoshi a set of wings. 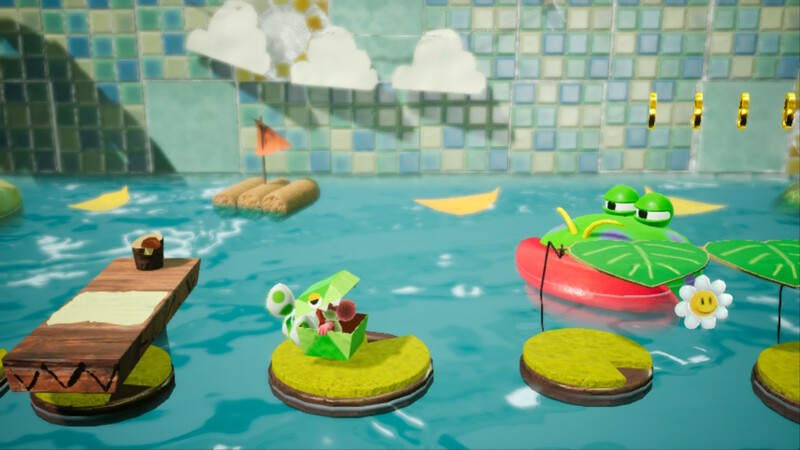 Even without use of Mellow Mode though, Crafted World rarely puts up a challenge until the very last of its levels (the post-game levels and boss in particular are comparatively tough!). 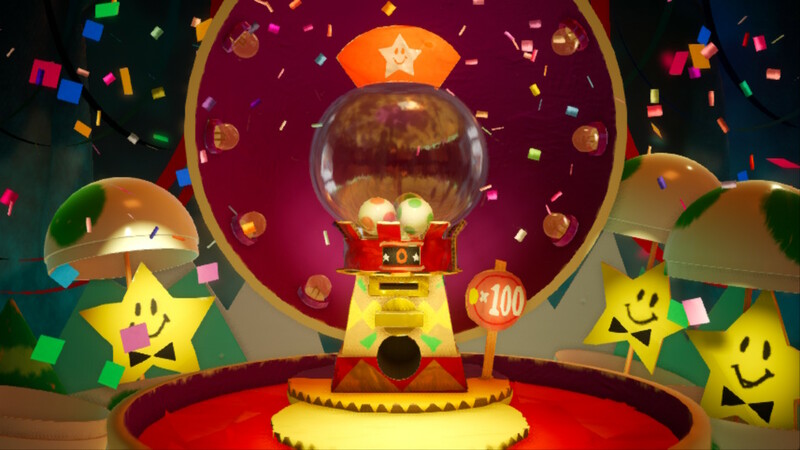 Add to this the new costume mechanic where Yoshi can spend coins on prize ball machines to unlock cute, homemade outfits that add extra hit points and it’s a veritable cakewalk. Like its peers, the game attempts to make up for the softer challenge by at least giving completionists a long list of secrets to find. Not only are there the usual optional collectibles, but each level has a ‘flip side’ that sees Yoshi run back through in reverse to look for Poochy pups. The best thing about these is the flipped perspective that shows off all the unfinished cardboard backs of the levels, which is a really cute touch. On top of that, every world has an NPC that tasks Yoshi with going back to each stage to find hidden objects, usually multiple times. I can appreciate the attempts to add some longevity to what would otherwise be a modest experience, but there’s a point where replaying the levels for the fourth or fifth time becomes a chore. My biggest gripe is the lack of a ‘restart checkpoint’ option, which means that if you happen to miss a secret or flub a shot with your last egg, you’ll have to either start over or cut your losses and go back again later. The whole game can be played with a friend in co-op, at least, which can help spice things up a little (in the game, that is). In spite of its flaws, Yoshi’s Crafted World is a pretty good time. Run-of-the-mill level design and a tendency toward repetition aren’t enough to take away from the series’ usual solid platforming and a seriously great aesthetic. Switch owners and Yoshi fans looking for a charming, easy-going adventure with a unique spin on familiar characters and worlds are going to get exactly that.